Bre'Onna is using Smore newsletters to spread the word online. Something must happen between different parties, that's when the cause of action arise, and they must have an arbitration to settle it. A case complaint must be filled out at the Superior Court Clerk's office. Service of the summons and complaints by sheriff, or any individual who is 18 or older and not a party to the action, they will also have a mediator. Defendant must respond to the complaint within 20 days of the date of service. If there is no answer, plaintiff may complete default judgement against the defendant for the amount claimed in the complaint. Discovering process between the parties, during the course of which various motions, or motions for more responsive answers, may be filed. Plaintiff or defendant files motion to assign case to the trial calender. Case solved either by agreement of the parties, or by the court order, or by the jury verdict. 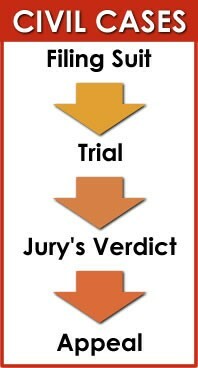 (During the trail) either or both sides may appeal the case to a higher court.